When the sun goes down, your landscape doesn’t need to go dark with it. There are many energy-efficient, attractive options for landscape lighting that can showcase your favorite specimen plants, prized flowerbeds and unique landscaping features even long after dark. Plants don’t need light 24 hours a day, so why is adding light to the landscape so popular? There are many reasons why you should consider adding a nighttime glow to your garden and yard. Entertaining: If you use outdoor space for entertaining, proper lighting can make it a bright, enjoyable area when your guests arrive and keep the party going even after sunset. Safety: The right lighting can help keep you safe when you’re enjoying your yard by illuminating stairs, gates and walkways to minimize the risk of trips or falls. Curb Appeal: Good landscape lighting highlights your home, lighting up not only plants but also stunning garden accents and your house’s amazing architectural features. Holiday Fun: If you have good lighting in place, it will be simple to add extra holiday lighting to your landscape whenever you wish, or to swap out bulbs for fun holiday colors. Show off the flowing curves or geometry of your flowerbeds and landscape features by using lights to mark different boundaries. You can also light up property lines or show the edges of pathways, decks and driveways to create inviting illumination that will welcome guests to your home. 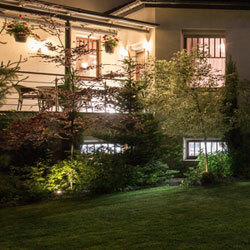 It is easy to go overboard with landscape lighting, but less can be more when adding a glow to your property. Consider where shadows fall to create a sense of space and texture with your lighting, and use cleverly positioned lights to draw eyes just where you want them. While you can choose landscape lights in both warm and cool colors depending on the type of lighting you prefer, don’t forget to consider the colors of the plants and structures those lights are highlighting. This will help you create a cohesive, attractive lighting design. If you have a stunning specimen plant in your landscape, a favorite piece of yard art or even an unusual architectural feature on your home, use lighting to highlight that detail. Uplighting and spotlights can be useful for showing off your proudest features. Lights set into the ground are often overlooked, but they can be an amazing component of landscape lighting. You can recess lights to help illuminate a pond, pool or other water feature, as well, giving the water a luscious glow after dark. The way you light up your landscape will create an evening and nighttime mood for your property. Lights can be positioned to create a dramatic feel, a romantic ambiance or an exciting party atmosphere. You can even opt for different types of lights to change the mood as desired. Too much light, or lights that are poorly positioned, can create light pollution that leaks through windows, lights up unwanted spaces, shines in the eyes of passersby or intrudes on neighbors’ spaces. Check your lighting plan carefully to be sure it is safe and attractive at all times, and consider timers to help control your lights appropriately. From simple solar lights to spotlights, lanterns, specialty lights and even fun light strands, there are many different ways to light up your landscape and bring a bit of brightness to even the darkest nights.